So much fun stuff today! Not only did Ty turn 4 months but we also toured a pre-school for Abigail and I think she (and Zach and I) really liked it. It is called Vaulting Frogs and it is a gymnastics based preschool so there are three rooms--1. has toys for playtime 2. has tables etc. for art and learning and 3. a big room for gymnastics which Abby loved. She bounced on a trampoline for the first time and had so much fun! Zach and I even left her there to see how she would do and went next door to a place called Tot Spot Cafe which is a coffee shop that has a huge play area in the middle for kids to play. It is internet friendly so I plan on going there w/ the kids and the computer to get some work done while Abs is entertained. It's only $6 for an hour to play there or $10 for the day. 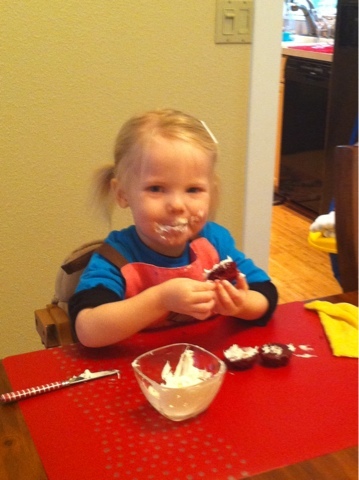 Abby whined/cried for a second while we left but when we got back she was in a smock and painting away! It was so dang cute. When we left she said bye to Miss Jenny. . .soooo, I think we will try it out for the next few months til the school year is over. 2 days a week from 9-11:30. I think it will be wonderful for the both of us. After we did the tour I let Abby go next door to play for a bit since I had been telling her we were going to see "toys" and we weren't at Vaulting Frogs for very long. . .She. Loved. Tot Spot! We were there for about a half hour and she played and played and didn't even care if I was there. It is such a cool place for moms (and dads) to take their kids. . .especially on a rainy day like today! When we were done with the tour and Tot Spot we then headed over to the doctor's office for Ty's 4 month check up. 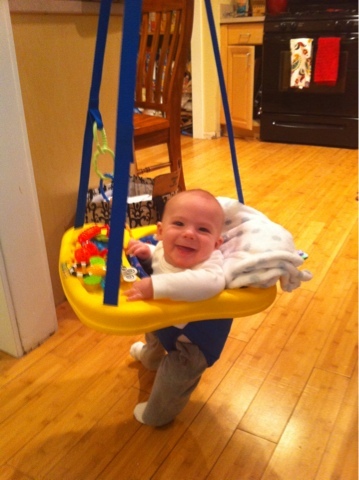 He is doing great developmentally and of course was just as happy as could be the whole time. He cried for one second when he got his shots but that ended as soon as I picked him up. . .such a good little boy. He is 26 inches tall (84%), 14.6 1bs. (30%) and his head is 35th%. I was surprised to find that he was only 30th% for weight cuz I think he is a chunker dunker but I guess he is my little skinny minny! It's been fun pulling out the new stations for him to play in. Every time I bring out the bumbo Abby wants to sit in it. :) Ty does okay in it but doesn't always look totally comfortable so I never leave him in there for very long. . .I'm sure as he continues to get stronger he will do better in it. I can't believe the roller coaster of emotions you go through after having a baby. . .it has been stressful and more difficult for me this go around BUT this past week and half has been REALLY good and I find myself admiring my children in ahhh so much. They are both so cute and I just love them so much. . .we had a big family hug the other day and every time I think about it I could just cry. I'm definitely at that spot again where I am so happy that I just feel like I could burst. . .oh how much better life is when babies go to bed easily. 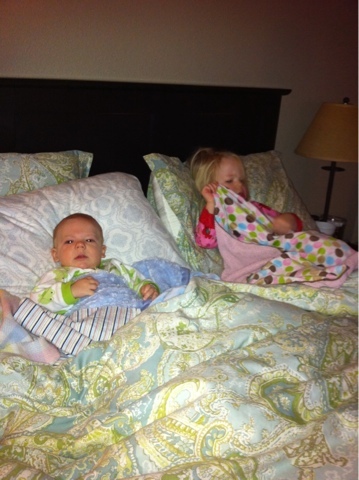 :) Both Abs and Ty have been awesome at bedtime and that makes for one happy Mama and Daddy! Today was a good day. . .
Anyways, another phone post--I've been trying really hard to keep Abby entertained w/ age appropriate activities lately such as a rice station, baking, well helping and then taste testing, and of course visiting Barnes and Noble and the library. She is sooo ready for preschool which we have a tour tomorrow and I am so excited to see how she reacts. Lately she has been so excited when other kids are around. "mommy, kids!". I love it. 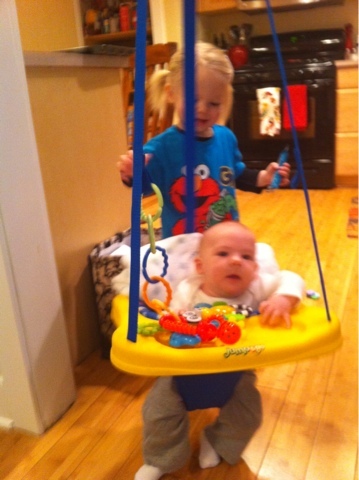 Ty rocked his Johnny Jump Up for the first time today and loved it. He has his 4 month check up tomorrow as well. Can't wait to see how big he is. He also has been dealing with his first cold. . .doesn't hardly phase him which is great. 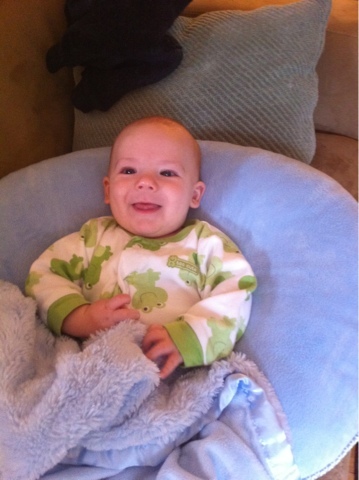 A little snotty nose for a few days and I think he is already getting better-Yah! I have to admit that the past 4 months have seemed really crazy to me adjusting to life with two children especially when one of those children is a toddler but I think we are finally getting some structure and routine down which is helping. Bed time has been going a little better this past week and the tantrums aren't lasting quite as long. . .I'm working really hard at staying calm :) and consistent w/ how I deal w/ my sweet girl and it seems to be helping. These pics are in newest to oldest order but let's get rolling w/ what's been up at the Wyckoff home these past few weeks. . . When Zach takes Abby to the grocery store she gets the special treat of riding in the car! She loves it. . .when she goes to the store w/ me I just give her whatever she wants to snack on in the cart--HA. . .that thing is just too big for me to push around. Not only is Abby driving the cart at the store but she also loves to drive our car in the driveway. She makes the car noises and really thinks she is cool. Again, this is something Dad introduced to her so now when we get home she tries to hop into the front seat for awhile before going inside. I had to go out to Alderbrook for a site tour on Friday and decided to call up Amy and the kids to join us for an overnight. It was quick (and Grammy stopped by to help for a bit) but we had tons of fun at the pool and playing on the luggage cart. The kids kept acting like it was a train and yelling "all aboard!". Ty is sooo big that he can no longer take baths in the baby tub in the sink. I got this great chair that goes in the regular bath so now Sis can enjoy bathtime w/ Brother--they love it. . .and so do I. The kids are soooo cute together. Grandma and Grandpa bought Ty and Abigail a membership to the Children's Museum so we can go to most of them throughout the US. Abby's first visit was in Tacoma and she had so much fun. 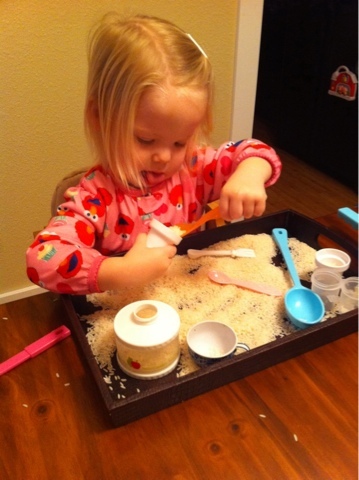 I am getting so excited for her to start pre-school soon. We have a tour at one this week and I really hope we like it!! The water tables were her favorite of course! She could have played here forever. When we were in Olympia last Saturday Joe and Janice had a surprise to tell us. We were all so curious as to what it was. . .engagement? baby?. . .nope, NEW puppy! Everyone meet Roca! Me and my little man all dressed up for Auntie Kora's shower. He for sure steals the girls' hearts with his cute little smile. Here's Aunt Kora at her shower for Baby Minton. We went with the Hungry Caterpillar theme since that is how they decorated the nursery. It looked so cute w/ a cake and banner made by Amy! Seriously, love this pic of the little man. He looks like such a bigga boy! My sweet babies! Abby loves to sit next to and play w/ her brother all the time. She is very protective of him and all of his belongings. Here she is showing him the airplane flying overhead. . .
Leah and Drew came to visit for a few days so we could host Lorissa's baby shower. Drew and Abs had lots of fun playing together and Leah and I had lots of fun too. . .even though we were primarily "parenting" our children. :) I soooo wish my BFFAE lived closer so we could get together more often. Maybe someday. Another shot of Abs and Ty playing together. Ty usually looks a little worried about what is about to happen while Abby is all grins. 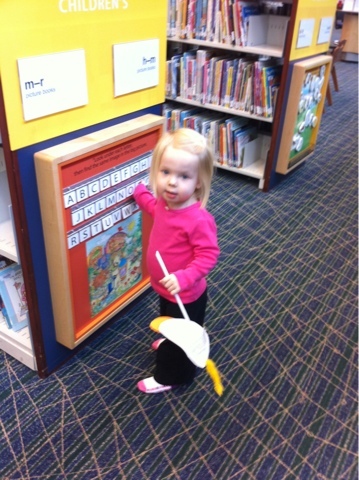 Abby's 1st trip to the library! Yesterday I loaded up the kiddos and walked to our local library for storytime. I was a little worried about Abby sitting still to listen to the stories but I soon realized that wasn't going to be a problem. . . The stories were very interactive, the kids got to sing songs w/ hand gestures, they got to dance and wiggle and make a craft. Abby LOVED it and it made me excited for her to start preschool! I think she is really ready for that type of environment. When we were done I let Abs loose in the library. 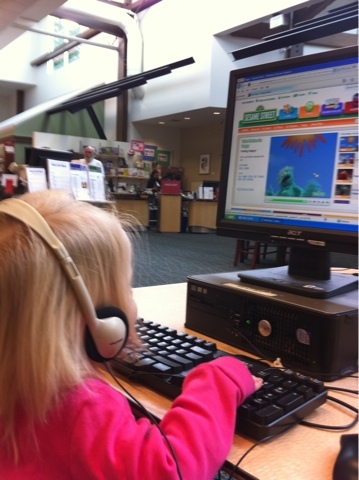 She was more interested in the puzzles, alphabet and of course, the computers than she was the books. We will definitely be going back!